Cold weather is driving hordes of Multicolored Asian Lady Beetles inside Mainers' homes, where they are not always welcome guests. Seasonal migration of wildlife has little impact on humans, unless that migration path leads directly into the home. And when the warm days of summer turn into the cool days of fall and chillier days of winter, that can happen as critters try to find a warm place to stay. So what is a Maine homeowner to do? It really comes down to what is getting in from the outside and an individual’s level of tolerance for sharing space. 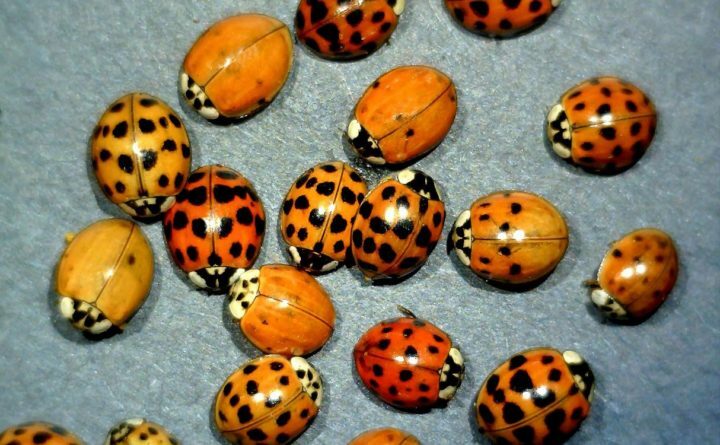 Once a frost or two hits, lady bugs, or more specifically the multicolored Asian l ady b eetle (Harmonia axyridis), start responding to their genetic trigger to group up and find a warm place to spend the winter. When they do, residents will begin seeing ever increasing clusters of the diminutive inspect in the corners of windows, attics or under the eaves in homes. The obvious solution to keep the beetles from getting in is to inspect the home and seal up any of those cracks. If they do get in, all the beetles will do is hunker down for the winter, but will become active again when temperatures rise. As for moving them out, Kirby suggests scooping them up with a dustpan or vacuuming them using a nylon as a filter over the vacuum hose so they do not get all the way inside the vacuum cleaner. Lady beetles are a natural predator of garden aphids and harmless to humans, beyond exuding a foul-smelling discharge if disturbed. Fall means ripe tomatoes, apples and other fruit in Maine. Unfortunately, it also means the presence of fruit flies (Drosophila melanogaster) heading right for that ripe fruit. “That bowl of apples might look good sitting on the counter this time of year, but if they get a little soft or get a bruise on them, it doesn’t take much [to attract fruit flies],” Jim Dill, a pest management specialist at the University of Maine Cooperative Extension, said earlier this summer. Also known as vinegar flies, fruit flies are attracted to overripe and rotten fruit. Their populations spike with the abundance of available produce and they gain indoor access on the overripe fruit itself or simply through an open door or window. It’s almost impossible to keep them out, but they can be controlled inside by keeping all produce in the refrigerator or covered on a table or counter space and by keeping trash covered. They can be trapped either by using store-bought traps or by using a homemade method with apple cider vinegar as bait. A simple fruit fly trap can be made using a small plastic bottle. To make the trap, cut off the top of the bottle at the shoulder, add a few capfuls of apple cider vinegar into the bottom of the bottle and then invert the piece that you cut off back on the top of the bottle, making a small funnel of sorts. The apple cider vinegar entices the fruit flies into the bottle through the narrow inverted opening, but most are not able to make their way back out. Once in the trap, to kill the flies, cover the top and either shake the vinegar around effectively drowning the flies, or to place the trap in the freezer for an hour or so. One way to keep warm when it gets cold is to find a quiet spot indoors and cuddle with a few hundred or so of your best friends. At least, that’s what cluster flies, members of the family pollenia, do during the winter months. Their name derives from the behavior of amassing or “clustering” out of sight behind household siding, shingles or other cracks and crevices in attics, lofts or other wall voids. Which is why even in the middle of a cold Maine winter, you may see cluster flies buzzing at windows. They are especially prevalent in areas having healthy earthworm populations as the lifecycle of a cluster fly includes an outdoor parasitic relationship feeding on the worms. As with other insect home invaders, the best defense is a good offense and that being with sealing up those cracks in the home or placing screens over attic vents and soffits. Large gatherings of the flies can be vacuumed up and released outside and commercially available products like insect strips and sprays can help. The good news is, according to Murray, cluster flies do not carry diseases or pathogens and don’t bite. As it gets colder and the furnaces crank up, mice — in addition to rats and squirrels — consider it an open invitation to move inside. They are looking for warmth and a steady diet, according to Dill, and all they need to get into a home is a hole or crack no larger than the diameter of a pencil. As such, Dill said the important takeaway in preventing the mice and rats from getting into a home is strict attention to sanitation and home maintenance. But should rodents gain access into a home, the situation can quickly escalate from a minor annoyance to serious threats to human health. The word “rodent” comes from the latin “rodre,” meaning “to gnaw,” and with their single pair of continuously growing incisors on the upper and lower jaws, rodents can do a lot of damage in a short amount of time. They are also carriers and transmitters of diseases in their droppings and urine and can carry rabies. If rodents can be heard scuttling inside the walls, or if the droppings are observed inside, homeowners should look for areas in which they are the most active and set out traps to capture them. The most popular traps are a plastic trap with a “jaw” that clamps shut when the rodent goes for the bait. These traps are designed with a mechanism allowing for the dead rodent to be removed without ever having to be handled. If the infestation gets serious enough, homeowners can call in professional exterminators. When it comes to natural bug control, few things can beat a hungry bat. According to Cory Mosby, fur-bearing small mammal biologist with Maine Department of Agriculture, Conservation and Forestry, all of the bats that live in Maine are insectivores and capable to eating their weight in insects every night. That’s up to 1,200 mosquitos, daily. Bats are much happier outside for the most part, but it’s not unusual to have them take up residence in a home’s attic or under the eaves. And periodically make their way into the human areas of the house. The important thing is to not panic, according to Mosby. Simply open a door or window, provide a clear path and the bat’s good eyesight and echolocation will do the rest, and they will depart on their own. Bats can squeeze through a hole or crack much smaller than its body, so it’s another reason to seal up any points of entrance in the home’s walls, foundation or roof. They are not normally aggressive but can carry rabies, so caution should be exercised in any bat-human contact. A lot of people are reporting seeing an increasing number of spiders indoors as summer winds down. Since they feed on insects such as the Asian lady beetle, fruit flies or cluster flies, it’s really not a bad thing to have a few spiders hanging around, Murray said. To evict them, the easiest and most humane thing to do is to place an inverted jar over the spider and slip a piece of paper under the spider and release it outside. They can also be vacuumed up, Murray said, but they won’t survive that experience. Once again, to keep them outside, seal up any cracks or holes in the house through which they can come in, Murray said.